Okay. 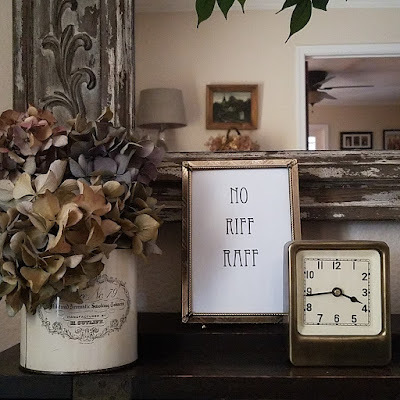 I don't know why I find this little No Riff Raff sign so funny, but I do! I spotted one on someone's feed yesterday (of course I can't find the post now) and wanted one for our house! I found the same one she had on Ebay for $32 (shipping from England! ), so I decided to just make my own. I printed it with an art deco-esque font in Word (So! Fancy!) and popped into a nearby thrift store (our Friday treat!) and found this stylish frame for 75 cents. Et Voila! What do you think?